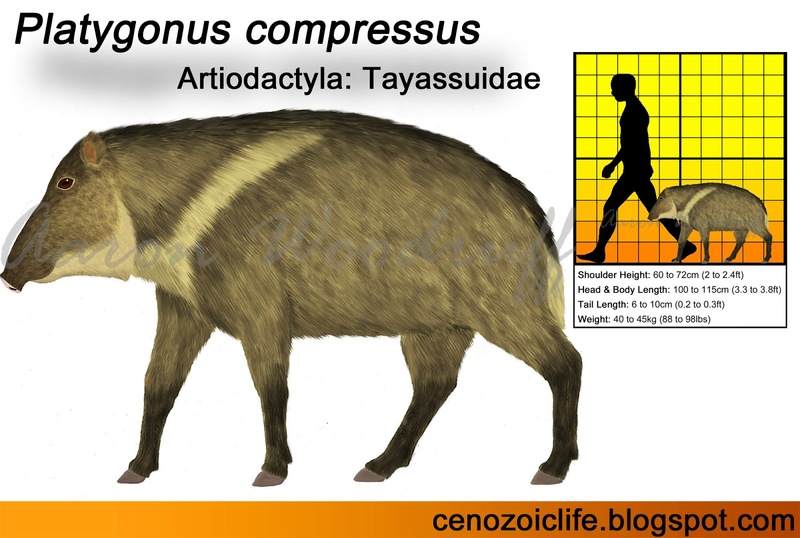 The Flat-headed Peccary (Platygonus compressus) was an abundant species of peccary that lived during the Pleistocene. Much of what we know about this species comes from Pleistocene cave deposits from the Midwestern United States. This species was first identified in 1806 and was fully described by John L. Lecont in 1848. Another new peccary was described in 1894 and given the name Platygonus leptorhinus, but this animal was later determined to be synonymous with P. compressus. The genus name, Platygonus, is derived from the Greek language, literally meaning "flat head". The species name, compressus, is a Latin word meaning "compressed", "restrained", or "repressed". Flat-headed Peccaries had a wide distribution, spanning from New York to California east-to-west and from the Canada to Mexico north-to-south. They inhabited grassland, savanna, and open woodland environments with a preference for areas with suitable bush cover and water sources. Flat-headed Peccaries were highly adapted to forage in relatively open environments. 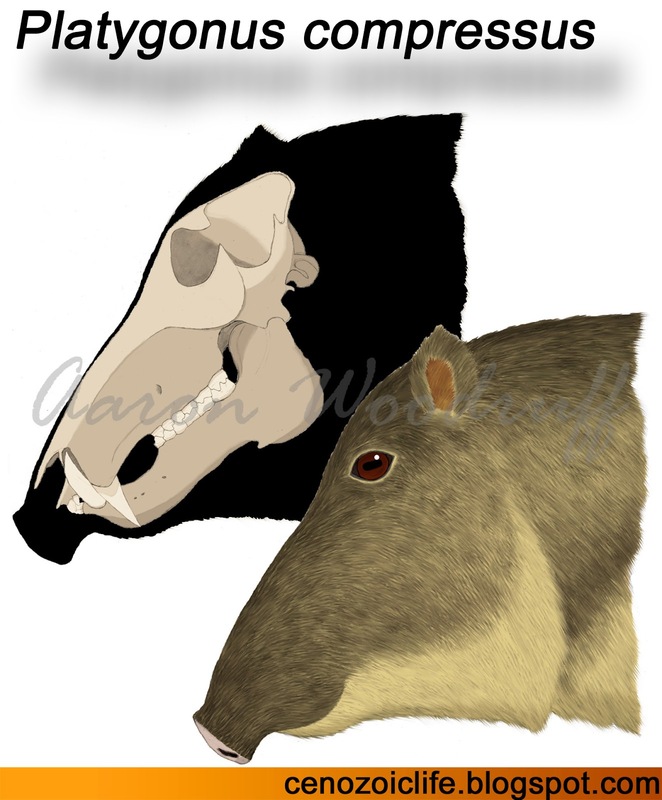 Compared to other contemporary peccaries, including those still alive today, it had a much more robust skull and mandible with a keeled chin. Its large eyes were also set higher and farther back on the skull suggesting keen eyesight and a wide field of vision. The olfactory* region of the brain is greatly enlarged and the nasal passages were wide and heavily turbinated*, hinting at an extraordinary sense of smell. High thoracic* spines supported powerful neck muscles and tendons that would allow powerful jerking motions of the head when feeding. The tail was also much longer than that of any living peccary and potentially could have served a function in visual communication. The limbs were long and slender for fast-running and the lateral toes had been completely reduced to tiny, vestigial* splints of bone. 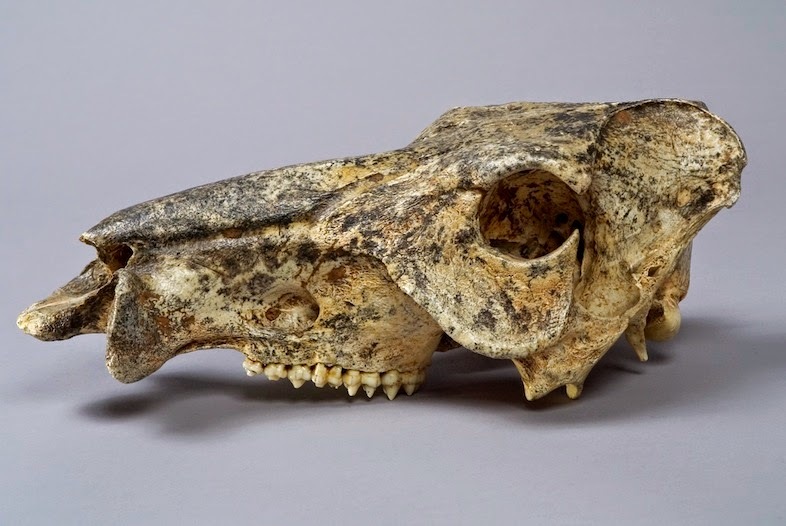 Flat-headed Peccary fossils are frequently unearthed from Pleistocene-age cave deposits throughout the United States, particularly in the Midwest region. These cave sites typically yield many hundreds of bones corresponding to dozens of individuals. Megenity Cave, Indiana currently stands out as the most prolific fossil peccary site in the world with over 600 individual Flat-headed Peccaries described! Long-term usage of caves must have been an important aspect of this species’ ecology. Living peccaries are known to readily exploit caves to relieve themselves from temperature extremes and as a communal nighttime shelter. Furthermore, we can infer that such caves would have been utilized by the same herds over successive generations given that today’s peccaries are all highly social and territorial by nature. Occasionally a sick, old, or wounded animal would die within these caves and their carcasses would then be scavenged by cave-dwelling insects and larger predators from outside. Human artifacts have been found alongside the peccary fossils at Sheridan Cave in Ohio, suggesting that humans and peccaries utilized the same caves, or that perhaps the peccaries were driven out by humans who then took up residence there. Flat-headed Peccaries would have been highly social and diurnal like living peccaries. Their nights would be spent sleeping communally within thickets, abandoned sloth burrows, or in caves, then setting out at dawn to feed. During the heat of midday they would seek out shady places in which to rest, usually under trees or bushes. Excretions from their dorsal glands would have been rubbed against group members, helping individuals to track each other and identify members of their own herd. These secretions are also used in living peccaries to mark the herd territory, and they would have had designated latrines around important spots. They fed on a wide range of foods, both hard and soft, abrasive and non-abrasive. Microwear analysis of the teeth shows that they were primarily browsers with a preference for softer above-ground plants. Their tall, bilophodont* cheek teeth and robust jaws were ideal for breaking down woody vegetation and seeds, but far less efficient for grinding grasses. They were, however, able to selectively graze on certain types of ground-based plants like forbs*. Like its living relatives will sometimes do, this species may have also occasionally taken animal foods like insects, small vertebrates, and scavenged meat. Salt licks would have been visited regularly to compensate for their low-sodium diet. The association of Jaguar (Panthera onca) remains alongside those of Flat-headed Peccaries at several cave sites suggests that the peccaries were an important prey item for this big cat, an association that still holds true today. Peccaries are among the most frequent prey items taken by modern Jaguars. After Jaguars, Cougars (Puma concolor) are the next most likely predators of peccaries, particularly of younger individuals. Other large cats and wolves, which prefer to hunt the larger ungulates, would have been relatively infrequent peccary predators. To avoid predation, Flat-headed Peccaries would have relied on their great speed and agility to escape. Also, as living Chacoan Peccaries (Catagonus wagneri) will do, they may have adopted an aggressive defensive behavior in which adults form a defensive line around the younger animals, charging and brandishing their sharp canines at a potential threat. 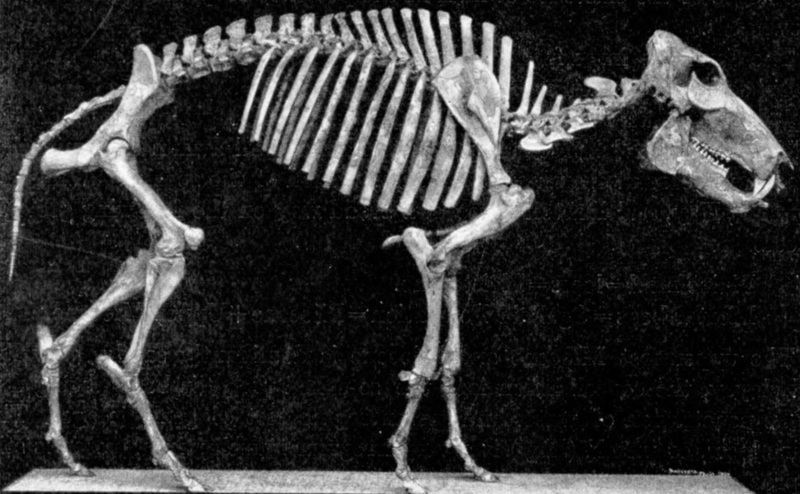 Mounted Flat-headed Peccary skeleton. Wiki. Bilophodont: cheek teeth with two transverse crests or ridges. Forb: an herbaceous flowering plant that is unrelated to grasses, sedges, or rushes. Olfactory: of or pertaining to the sense of smell. Thoracic: relating to the vertebrae of the upper back. Turbinate: scrolled sheets of spongy bones found in the nasal passages of vertebrates. Vestigial: a physical structure that has become greatly reduced despite having been more prominent in an ancestor.